I have a confession to make. I might be slightly more excited to see Maleficent than my 8 year old. (I mean, it looks so good!!!) So imagine how thrilled I was to hear that MAC is also doing a makeup line based on the Disney movie! The limited edition MAC Maleficent Collection will be available online on May 8th, and at select MAC stores, as well as Macy's on May 15th. (My birthday!) The collection features deep sultry rose lip shades, neutral eyeshadows, and complexion-enhancing sculpting powders. Prices will range from $44 for an eyeshadow quad, to $17.50 for a ruby red lipstick, to achieve Angelina Jolie's sinister pout. To be honest, I was expecting to see bright bold colors associated with villains, but I was pleasantly surprised to see that the collection is totally wearable for everyday - including the 2 sets of false lashes! Take a look, and tell me what you think of the collection. 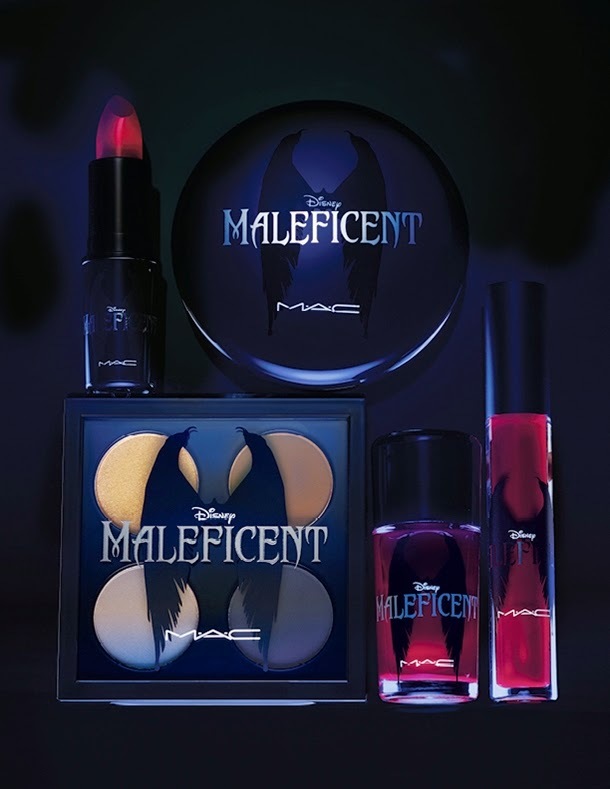 I can't wait to see the movie.....& I'm so amazed with these MAC stuff! I'm glad I'm not the only one who's really excited about seeing the movie! Haha.